We both grew up on the East Coast, and we have to confess that we both thought that the people from California that we met were kind of obnoxious. All they could talk about was the wonderful food and weather in their home state. Then we moved here, and we turned into those people. See, the weather is really great, and the food...well, it's pretty good too. One sign that we might have become obnoxious Californians is our tendency to gloat when we have a random week of 70 degrees and sunny weather in the middle of January or February, and we check the forecast for Connecticut or New York or North Carolina or D.C. and we see temperatures in the teens/snow/sleet/ice, and we just can't resist sending our families an email with our weekly forecast, or a picture of us enjoying the sun in our backyard. So we fully realize that it was probably our fault that for most of May it just kept raining and it looked like we might not have a summer at all. It's only fair that our friends and family out east were having backyard barbecues and going to the beach and talking about what to cook when they didn't want to use the oven or the stove, and we were still thinking about braises and baking and how to fight off the cold. Finally, in early June, we had apparently been adequately punished, and we started to get nice warm days of sunshine. We ate breakfast and lunch outside in our garden. We went on long walks and bike rides and basked in the sun (after putting on plenty of sunscreen, and trying to sort through all the new rules). It was even almost warm enough in the evenings to eat dinner outside, if we wore sweatshirts (warm summer evenings are definitely one thing that the East Coast has over us). We fired up the grill and started to think about warm weather foods, and one of the best meals we made started off a tuna ceviche from the Doña Tomás cookbook (for our main course we tried these very tasty chicken skewers with mango salsa from Turntable Kitchen). The cookbook was a gift from our friend Michelle, and this was the first recipe we tried from it, and it was a good one. The original recipe is for halibut but we subbed our favorite raw fish and kept the rest pretty much the same. It's so simple and easy to put together, no cooking required, and is a wonderful fresh tasty dish for summer. The first time we made it we let the ceviche marinate for a while so that the fish got cured by the acid in the lime juice (the pictures here are from this meal); it was good, but not as good as the second time we made it, when we served the fish immediately. We found that the curing changes the texture of the fish and takes away that nice tender quality that tuna has, so we recommend serving right away. Of course, this week we had a rare June rainstorm, though it was also raining in Connecticut and North Carolina, so we can call it even now, right? Bring a small pot of water to a boil. Remove the husks of the tomatillos and cut out the stem. Rinse them (they're a little sticky) and put them into the boiling water; cook for 4 minutes, then remove. Put the tomatillos with the rest of the ingredients into a food processor and blend until smooth. Cut the tuna into thin strips, about a half inch wide, and then slice the strips into pieces about 1/8 inch thick. 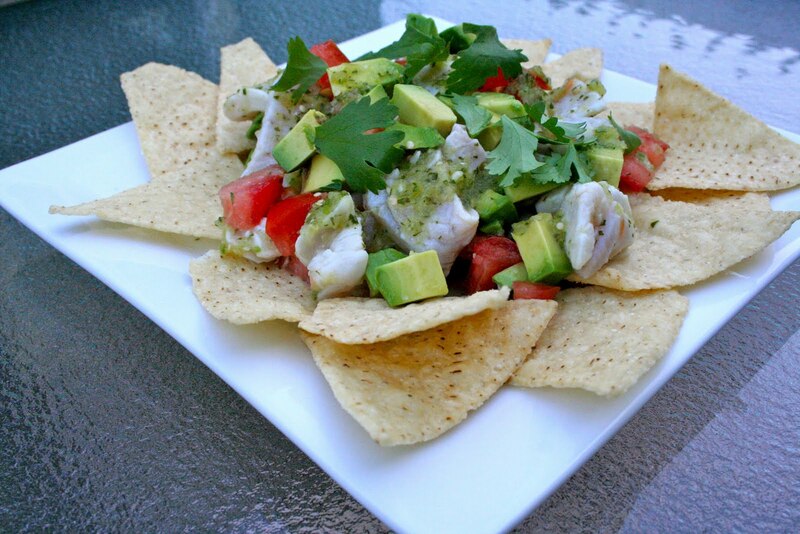 Toss the tuna with the lime juice and some salt. Put all the other ingredients into the bowl, including about half of the salsa. Taste and add more salsa if necessary (you want the mixture to be just coated, but not too wet). 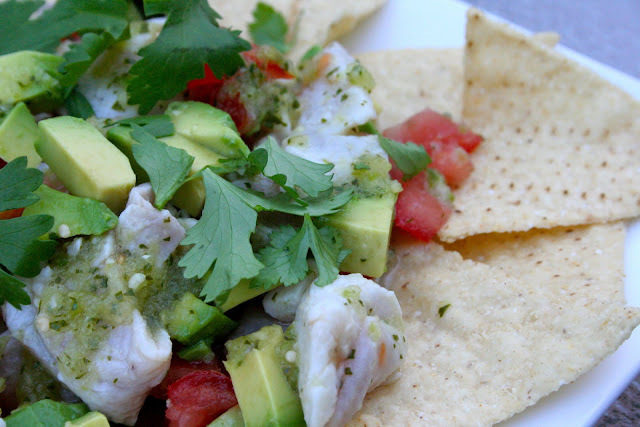 Put the ceviche onto plates and serve immediately with tortilla chips (if you let the mixture sit the lime juice will start to cure the fish, changing its color and consistency). Thanks for sharing this with me! In person and online.